In June, volunteers from the T.H.E.M. 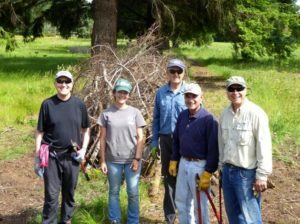 (Tuesday Hiking Especially for Men) hiking group teamed up with Capitol Land Trust to build new habitat features at Bayshore Preserve! 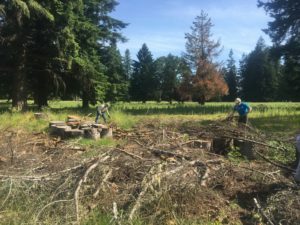 As we were preparing 10 acres of the Preserve for prairie restoration, several large conifer trees were removed to provide space for prairie plants, such as oaks. 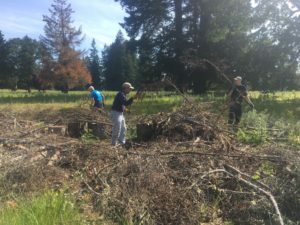 Instead of removing the wood, we thought it would be most beneficial to create brush piles, from the downed trees, for habitat along the edge of the growing forest. As a former golf course, Bayshore lacked the critical habitat created by fallen woody debris. Dead and decaying wood are important features in many natural areas, but are often overlooked or removed. As the wood decomposes, nutrients are recycled into the soil and organic material accumulates creating favorable conditions for new plant life. Piled brush also provides small animals cover from predators as well as protection from the elements. The decaying material results in perfect growing conditions for fungi, which feeds insects and animals like turtles, birds, mice, squirrels, and deer. Feeding on the tiny arachnids and insects are birds like woodpeckers, nuthatches, and sparrows. Even amphibians and reptiles call these places home. To create these brush piles, the first step was to roll the largest logs together, making sure to leave space in between for critters to travel through the structures. Smaller branches and twigs were then placed on top. Now that these structures are present, come visit Bayshore Preserve and take a moment to observe the wildlife using the new brush piles! In addition to fallen wood on the ground, standing dead wood is also a critical component of a healthy forest ecosystem. If you’ve been walking around Bayshore Preserve, you may have noticed some trees are cut around the trunk and are now dying. This is a process called girdling. Standing dead trees, or snags, provide critical nesting habitat for 39 species of birds and 14 species of mammals west of the Cascades. Many other wildlife species need these dead or dying trees for nurseries, storage areas, foraging, roosting, and perching. To learn more about standing snags, visit this WDFW website. By creating standing snags and brush piles, Capitol Land Trust is working to provide homes for our woodland friends!